TUMEKE! : When will National be sending in officials to arrest Remuera Housewives? 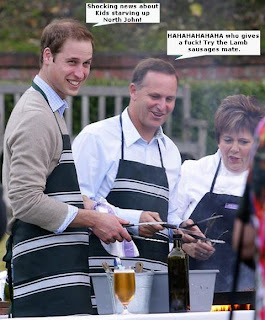 When will National be sending in officials to arrest Remuera Housewives? $23 million a year in welfare fraud. $140million per year in tax avoidance. If we are arresting the partners of welfare fraud, when are we throwing the rich housewifes into jail for knowing hubby is hiding his wealth? We won't be doing that will we because this latest piece of bennie bashing crap isn't about solving problems, it's about distracting the voting population from another bad week for the Government. Throwing beneficiaries into John Key's brand spanking new private prisons where they will be forced to work 40 hours per week is one way to lower the unemployment rate, but so would forced exile from NZ for every solo mother. The rules around when a boyfriend becomes a 'partner' which then lower the amount of welfare they can claim seems draconian in the extreme when you consider it's a year inside or a $5000 fine now pending if they catch beneficiaries out. You know whenever this Government are having a bad week and need a diversion the moment they start dog whistling welfare reform and the sleepy hobbits buy the spin hook line and sinker. Seeing as one of the ways officials will be able to expose a relationship is by dawn raids to see who is sleeping where in welfare homes, I'm astounded once again at how a nation that screamed Nanny State over the repeal of section 59 doesn't blink an eyelid at an Orwellian Government if they are invading the homes of the poor.